You searched for all products matching "mineral specimens"
Item #MS-557: Average approx. 2"x4.75" tall Kunzite Crystal (Brazil) specimen mounted on wooden stand. Under short wave light, this specimen will fluoresence orangy pink. 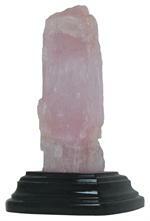 Item #MS-558: Average approximately 2.5"x3.75" tall Kunzite Crystal (Brazil) specimen mounted on wooden stand. Under short wave light, this specimen will fluoresence orangy pink. Item #AM-LAB-12: 2.75"-3" Polished Labradorite Feldspar massage stone (Madagascar). Item #AM-PLB-15: Approx. 2.25"-2.75" polished Labradorite specimen (Madagascar). Item #AM-LND-JS-15: 3.75"-4.75" Landscape Jasper (China) on wooden stand. Item #IGM-LL-MW-13: 3.75" long, Lapis Lazuli Massage Wand. Item #PWT-AM-LSM-8: Approx. 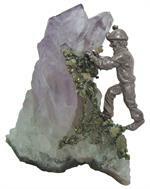 1.5" pewter miner on 1" or larger Amethyst crystals. Item #MS-331: Lemanskiite Specimen from Abundancia Mine, Guanaco, Chile. Sizes vary. Approximately 1.5" - 2". 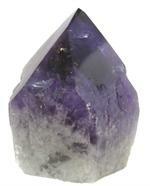 Item #MS-531: Lepidolite is light purple and white and is part of the Mica family. Our specimens, from Minas Gerais, Brazil, have sparkle and a pearly luster on the cleavage direction. Lepidolite has a Mohs hardness of 2.5 to 4. Averages 1.5" wide. Item #MS-247: From Congo; 4"x6.75"x3.25"; 4.90 lbs. ; Green on Brown matrix. Item #MS-578: Malachite Specimen from Congo. Approximately 4" long. Item #MS-655: Average 3" long Malachite Specimen from the Shaba mining area of the Congo. Most display the botryoidal or grape cluster formation seen in Malachite, while others have tiny crystals covering the surface of the specimen. Item #AM-MPS-250: Our 7 1/4" x 5 1/4" X 1 1/2” Polished Malachite Specimen comes from The Congo. The botryoidal surface of the Malachite was polished to reveal colorful green bands in bull’s eye patterns. 4.34 lbs. and comes with wooden stand. Item #MS-976: Average 1 1/2" - 2" Manganocalcite specimen. Item #MS-208: 1"-2" Mexican Opal in Rhyolite matrix. 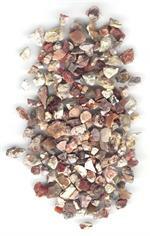 Item #MX-OPR-15: Our Mexican Opal rough in Rhyolite is in shades of red, orange and yellow. The rough pieces range from .25" to .75" long. 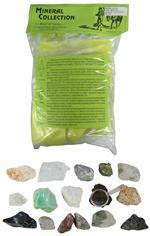 Each assortment is packaged in transparent plastic bags; 1,000 ct. TW. 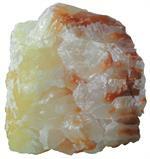 Item #MX-OPR-1LB: One pound of Mexican Opal rough packaged in a transparent plastic bag. 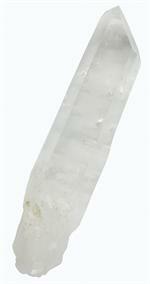 Item #MS-977: Average 3"-5" Mexican Selenite specimen. Item #CPR-NG-12-5: 12 pieces of Michigan Copper nuggets. Item #BH-MC-15/20: 15 identified specimens including Agate, Alabaster, Calcite, Fluorite,Gold Ore, Jasper, Lava, Lepidolite, Marble, Quartz, Obsidian, Pumice, Pyrite (Fool's Gold), Selenite and Sodalite. Collection comes with a 4 1/2X magnifier. Item #AM-GP-30: Approx. 1.5"-2.75" sliced, mini Agate geode pair from Rio Grande do Sul, Brazil. Item #KGG-MOH-7: Mohawkite specimen ranging in size from approx. .75"x1"x.25" to 1"x 1.25"x.75" Mohawkite is mainly a copper-arsenic compound. It also contains cobalt, silver, nickel and iron. Found only in Michigan. Item #KG-NC-3: 1" Copper specimen. Native Copper bearing rock from Michigan’s Keweenaw Peninsula is crushed leaving behind these jagged copper specimens. Some have host rock attached. Item #MS-805: 5" Natural Agate (Brazil) massage wand. 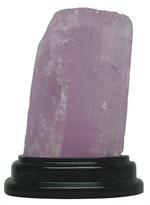 Item #MS-806: 4" Natural Agate (Brazil) massage wand. Item #BAS-NTL-5: Average 4+" Natural Brazilian Agate slice in assorted colors and patterns. Item #MS-553: 1 lb. T.W. bag of .5"-2" long Natural White and Green Calcite (Mexico) Crystals. Item #AM-OC-SP-6: Approx. 1.5"-2” Optical Calcite (Brazil). Item #AM-OPC-40: 2” Polished, Iridescent, Optical Calcite. Item #AM-OC-SP-35: Approx. 2.25"-3.75” Optical Calcite crystal (Nashik, India). Item #AM-OC-SP-20: Approx. 2.5"x1.25”x1.5" Optical Calcite crystal (Nashik, India). Item #MS-562: 1 lb. T.W. bag of slightly banded with some white layers, Orange Calcite Crystals (Zacatecas, Mexico). Item #MS-1015: Approx. 7"x5"x7.5" orange Calcite specimen (Mexico) of 13.94 lbs. Item #MS-1016: Approx. 8.5"x6"x5" orange Calcite specimen (Mexico) of 11.76 lbs. Item #MS-197: Orpiment, named for its golden color, is an arsenic trisulfide frequently found with Realgar. It develops in low temperature veins and hot spring deposits. From Russia, these specimens average 1" in length. Orpiment has a hardness of 1.5-2.